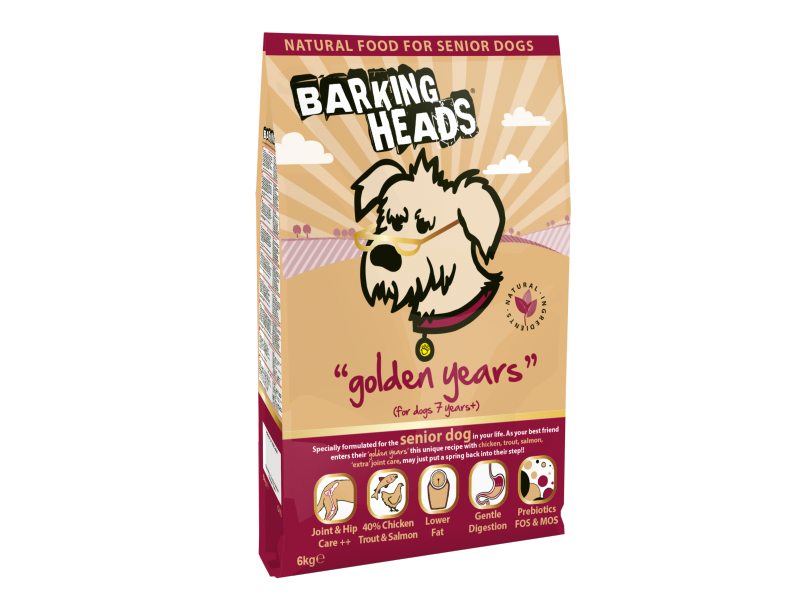 Barking Heads "Golden Years" is a light calorie diet for senior dogs, specially formulated to provide dietary and nutritional support throughout the ageing process. Aimed at dogs 7 years and up, it combines a carefully selected formula of digestible ingredients to accommodate the needs of slower digestions and metabolisms, so you can be assured your older dog is receiving the very best dietary care. With delicious and nutritious salmon and chicken- rich sources of protein- and wholesome brown rice to satisfy appetite for longer between mealtimes and encourage weight maintenance. The diet also contains a beneficial blend of natural antioxidants to strengthen your dog's defenses, and advanced glucosamine and chondroitin sulphate to provide joint and skeletal support for a healthy and mobile dog. Golden Years is now also available in a wet variety containing freshly prepared British chicken, salmon, brown rice, vegetables, herbs and hip & joint care, all gently steamed to help put a spring back in their step. There are also no artificial colourings, flavourings or preservatives, and no GM ingredients. The following table is a guide to feeding Barking Heads Golden Years. All dogs are unique and other factors such as age, activity levels, growth spurts can have an effect on their nutritional needs. Please check with your vet that you dog is at their correct healthy weight. Although your dog may want to devour the whole bag we recommend that your introduce any new food gradually, replacing 25% of their existing food every day until they are eating 100% Barking Heads. Always ensure there is a fresh bowl of water available at all times. Daily Suggested feeding amounts for Barking Heads Golden Years. There are currently no questions for Barking Heads Golden Years Dog Food - be the first to ask one!